Probably the best course in Midlands. Great holes which require a good imagination. A great test, with heather, gorse, bracken and pine in abundance. In great shape. A thorough clear out of trees and undergrowth has opened up this fine heathland. It was soldier and poet Rupert Brooke that famously said ‘there’s some corner of a foreign field that is forever England.’ And while golf may have been the last thing on his mind it is here at Hollinwell, deep in the Nottinghamshire countryside, that you really get a feel for the meaning of that famous quote. 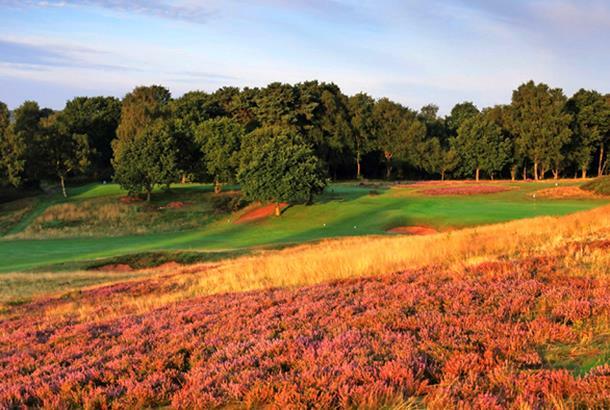 Many will have heard of Notts Golf Club as a ‘nice’ traditional heathland track but have never been dissuaded from the ‘accepted’ list of the UK’s best golf courses. Big mistake. This course is right up there with the likes of Woodhall Spa as one of the very finest inland courses around. From the moment you break out of the trees on the way in and spot the white clubhouse, welcoming you with smoking chimneys and traditional English fayre such as teacakes and bacon rolls, you know you’re in for a special day. And you are not disappointed. Set in the gently rolling hills at the heart of Robin Hood country in a natural valley within Kirkby Forest that fully utilises the natural undulating terrain, Hollinwell offers heathland golf at its very best. Notts Golf Club was formed in November 1887, and the first competition was held in that December on Bulwell Common Towards the end of the century, there were three clubs using the golf course (which was owned by the council), and non golfers were causing 'inconveniences inseparable from playing golf on a public common'. It was therefore decided to seek a 'suitable tract of land that could be acquired on practicable terms and devoted exclusively to the game'. Thus it was that in 1889, Mr CR Hemingway, contracting for the Great Eastern Railway, noticed the bracken covered slopes at Kirkby Forest, fourteen miles out of the city, on the road to Mansfield, in Byron Country, near to Newstead Abbey and the hills of Annesley was perfect for the venue. Willie Park Jnr was contracted to inspect the land and lay out an 18 hole golf course. The name Hollinwell was adopted in December 1900, shortly after the incorporation of the golf club, the name being taken from a natural spring on the course from which members could (and still do) take refreshment. The new course opened for play on November 3rd 1901. Shortly after the course opened the Great Central Railway opened a station at Hollinwell 200yards from the clubhouse, and this remained open until the late 1940's. The refreshment hut at the 9th is called the Hollinwell Halt, and the bench there comes from Nottingham Station. In 1912 the three holes to the west of the drive were opened, and the course took on the basic layout it has today. In 1924 the course was purchased from the Ecclesiastical Commissioners for the sum of £6000. Unfortunately shortly after this, the original clubhouse burnt down, and was replaced by the current clubhouse at a cost of £10000. It opened in April 1924. Notts soon became a venue for major national golf tournaments and has hosted such events as the English Amateur and the Brabazon Trophy ( English Amateur Strokeplay Championship) on several occasions. It has also hosted major professional events, and when the John Player Classic was held in 1970 it had the largest amount of prize money in the world at that time. The club has had only six professionals the most notable being Tom Williamson and Brian Waites. Tom Williamson was professional from 1896 to his death in 1950. As a golfer he was among the best for all of his life. He played in every 'Open' from 1897 to 1947, a world record. He regularly played foursomes with Harry Vardon. He was also a noted club-maker and was the first person to number the iron clubs although he did it the wrong way round, starting with 1 for the niblick. Brian Waites was at the club from 1969 to his retirement in 1998. He became that rarity amongst golf pro's in that he combined a successful career as a club pro with a very successful career on the European tour winning several professional tournaments culminating in his selection in 1983 for the Ryder Cup. Later on he was successful on the Seniors tour. The course drains very well and the greens are in superb condition. It is a pleasure to play. Every hole is different, each a challenge. a great test of golf. Once you've driven down the long inviting driveway the picturesque clubhouse sets the scene for a stunning golf course. From tee to green the course is extremely well manicured. It's a challenge for all abilities as the yellow tees offers some advantage, but if you are brave enough it's worth going off the blue tees (7000+ yards). The cost is high, but go for a winter deal as the course remains dry in the winter. Check with the Pro when booking as the clubhouse dresscode rules must be observed. what a entrance, the drive in down to the clubhouse sets you up nicely ! a lovely course that twists and turns in all directions and provides a great mix of holes (best hole is the 13th !). super old clubhouse !